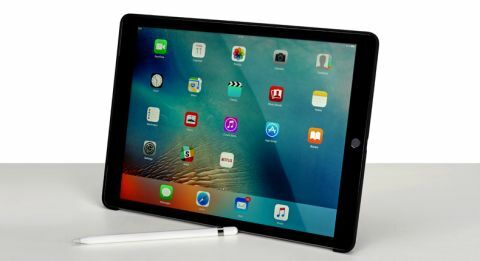 Apple iPad Pro 12.9in review | What Hi-Fi? Ever since Apple announced the iPad Pro late last year, people have struggled with how they should label it. Is this a laptop replacement or just a really big iPad? The thing is, trying to shoehorn it into a single category is either misunderstanding what Apple has tried to do here, or selling it very much short of what it’s capable of. In reality, it sits somewhere between the two. It looks very much like the rest of the iPad family, with its gently curved edges and brushed-metal chassis seeming very familiar. Of course it’s much bigger – and to begin with feels stupidly so. At 12.9in, the iPad Pro dwarfs the iPad Air 2 and makes the iPad mini 4 seem almost toy-like. But it isn’t long before everything clicks into place and it all seems so obvious. Going back to the Air 2 after an hour with the Pro, we had to check we hadn’t picked up the mini by mistake. All of a sudden it feels like this is the size of iPad that makes sense. Just as with a phone screen, the iPad Pro’s larger screen makes everything you do – whether it’s watching movies, browsing the web or working on documents – an inherently better experience. Apple has made sure that making the jump in screen size doesn’t mean any unnecessary bulk either. Assuming you can make room for its bigger size in your bag, at 6.9mm thick, it’s close to iPad Air 2 levels of slimness, and at 713g it’s still much lighter than your laptop. At 12.9in, there’s 78 per cent more screen to go at here than with the iPad Air 2, and with a resolution of 2732 x 2048 and an iPad Air 2-matching 264ppi, it’s the highest-resolution Retina display on any portable device – its whopping 5.6 million pixels tops even the 15in MacBook Pro. They come together and offer a superb video experience that’s hard to fault. Colours are slightly more muted here than on the iPad Air 2, but they never appear dull or washed out – just more natural. Contrast is still superb, with whites bright and blacks deep, while edges and outlines are always well etched and solid. The bigger screen isn’t only better for video. The extra screen real-estate lends itself well to things such as multi-tasking, meaning the split-screen capability brought in with iOS9 makes even more sense here. While the screen might be the headline feature, there’s plenty more for the iPad Pro to shout about, including a new, more powerful A9X processor. It promises to be 1.8x faster than the A8X in the Air 2, with double the graphics performance and twice the RAM. There’s certainly no doubting it’s fast. It wades through processor-heavy tasks like movie and photo editing without worry, so it makes easy work of more menial tasks like browsing and multi-tasking. There are no stutters when jumping between apps or swiping through menus and webpages. Gaming is also super-smooth and lag-free. The iPad Pro runs on iOS9, so can only run apps from the App Store, rather than the desktop software your MacBook would be capable of (such as full Adobe Photoshop). If anything, that’s what the iPad Pro is waiting on for its size and power really to make sense – more specifically designed apps that take advantage of its bigger screen and faster processing capabilities. A large part of the iPad Pro’s charm is its emphasis on creating things, removing a level of technicality to put you into a much more natural set-up, with all the simplicity of pen and paper on a hugely advanced digital interface. This is certainly aided by Apple’s Pencil accessory – a stylus-type device available separately for £79. We say 'stylus-type' because this isn’t something you’d use for general navigation, but for more precision design work or notes. It’s a joy to use, weighted perfectly in the hand with sensors that detect its position, level of pressure and angle. There’s another official accessory for the iPad Pro, and that’s Apple’s Smart Keyboard – a £140 protective case that doubles as a stand with a super-slim foldable keyboard built in. With a closed-key design, it is both spill-proof and wipe clean and, unlike some third party alternatives, doesn’t require separate charging. Instead it connects to the iPad Pro via its three-pronged Smart Connector, which powers it whenever it’s in use, by way of conduction. To keep the keyboard so slim (4mm), the keys are quite shallow, so don’t have the same level of travel as you’ll be used to from a laptop, which might take some adjusting to. Otherwise, it’s the same size as a regular MacBook keyboard, and so typing on it is surprisingly comfortable. We do wish the screen tilt were adjustable though. On to music and there have been some significant changes here too. Firstly, there are now four speakers – one at each corner – that create a much bigger, more solid stereo sound. They’re intelligent speakers too, changing their focus with the iPad’s orientation – while all four will produce bass frequencies, the upper two will dedicate themselves to high frequencies for a cleaner, clearer sound. The performance using headphones seems to have a better sense of space, too. Cameras have very little place on tablets at the best of times, let alone those measuring in at 12.9in. But Apple has included them all the same, with the same front-facing and rear cameras as the iPad Air 2. This means an 8MP f/2.4 lens on the main cam with autofocus and 1080P video capabilities, and a 1.2MP, 720p Facetime HD camera on the front. As ever, you’ll get passable shots in good light, but it’s worth remembering there’s no flash here so it’s not one for low-light snapping. We're big fans of the iPad Pro. Its larger, improved screen makes for a superb movie-watching experience, while its power boost means it’s as fast and smooth as you could ever want it to be. Add that to improved audio across the board, and some excellently considered accessories, and you have a superb tablet proposition – assuming you have the space and budget of course, because the iPad Pro is not cheap. Starting at £680 for 32GB with wi-fi and going up to £900 for the top spec (128GB + 3G), there are plenty of laptops you could get for less. But then you wouldn’t buy this if you wanted a laptop. The iPad Pro is very much a tablet, and quite possibly the best tablet on the market today. It proves that size most definitely matters. And when it comes to tablets, bigger is certainly better.